It is saying that shell and goddess Lakshmi comes from sea and they are siblings. Shell is the form of sea. According to mythology shell origins from sea. It is the brother of goddess Lakshmi. It is believe that where there is shell there is money. It is very beneficial while using in auspicious ceremony. You can establish in your puja. You must have to establish shell on Diwali, Navratri, Holi, Shivaratri, Ravi-Pushya and Guru-Pushya Nakshatra. According to science the voice of shell is very important. Atmosphere becomes clean by its voice. It kills bacteria from the atmosphere. Keep lemon water in shell. It increases the calcium level. By blowing shell the chances of heart attack and lung problems reduces. Speech problem also reduce. There are many types of shell and they can be worship by different ways. There are three types, 1) Dakshinavarti shell 2) Madhyavarti shell and 3) Vamavarti shell. Lord Vishnu’s shell is dakshinavarti and goddess Laxmi’s shell is Vamavarti. If you keep Vamavarti shell in your home then you do not have shortage of money. Krishna’s shell is Paanchjanya. Children problems can be removed by keeping this shell. 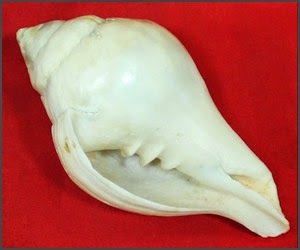 There are also Mahalaxmi shell, Moti shell and Ganesh shell. Take white shell and clean it with Gangajal and milk. Keep in pink clothe and place at worship place. Blow it 3-3 times after worshiping in evening-morning. Wash it and keep at its place. You must have to keep shell in cloth or seat. You must have to blow it only in morning-evening. Do not give others to use shell or never take from others. You can remove mental stress by taking bath from shell. You can also keep shell near your head while sleeping. You can get relief in mental disorders. Extra Remedy: Do not use shell in lord Shiva’s worship else you will not get good benefit.